Khalid Mohammed Osman is a Sudanese Author, Journalist & Activist! I assure you that you'll read interesting things here and know exactly that the page isn't precisely about Khalid Muhammed Othman. But, please note that the page is bilingual and it's part of the bilingual section of the HOA Political Scene Blog. So, Arabic readers, please scroll to the Arabic section of the page. Omar al-Bashir, is well known, not only as the so called president of Sudan, but also as international criminal in the Sudan wanted by the International Criminal Court (ICC), for crimes against humanity, not only in Darfur, but in so many places in the Sudan, including south Kordofan, Sudan. So, the Sudanese intifada is designed and will be always a fire to eliminate him and his companion leaders, along with their mercenaries. 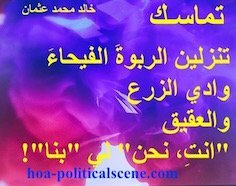 In other words, the elimination of this totalitarian regime, led by criminals who committed massacres against the Sudanese people, is the goal of all the Sudanese uprisings inside the country and the Sudanese protests abroad. 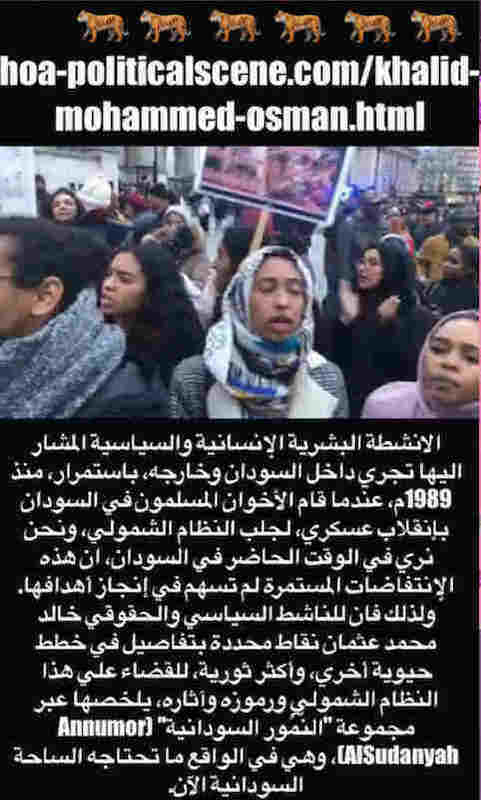 The uprisings in the Sudan and the protests abroad have erupted since the day the so-called National Islamic Front (NIF) came up with this bloody regime in 1989, through a military coup. 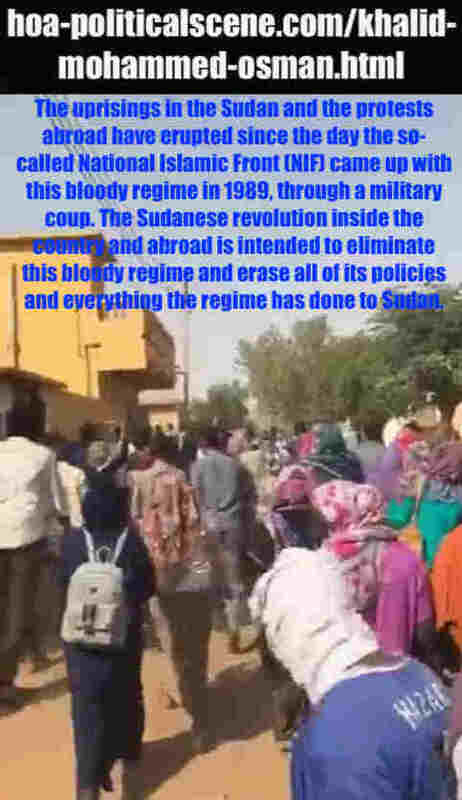 The Sudanese revolution inside the country and abroad is intended to eliminate this bloody regime and erase all of its policies and everything the regime has done to Sudan. Since the early days of the Sudanese revolution, Khaled Mohammed Osman continued to organize, participate and share these uprisings, in planning, motivation and constant calls for the success of the uprisings. He provides way maps for the revolution, keys for the revolution to succeed, as he keeps writing and translating international criminal memoranda and submitting them to human rights organizations. Khalid Muhammed Osman has also sent memoranda, he achieved writing in Arabic and translating to English to the revolutionary Sudanese groups, in which they participate, to make use of them and to submit them to human rights organizations in the states where they protest. The Sudanese people are still protesting against the repressive practices of the Sudanese fascist regime taken against them. They protest peacefully inside the Sudan and abroad. 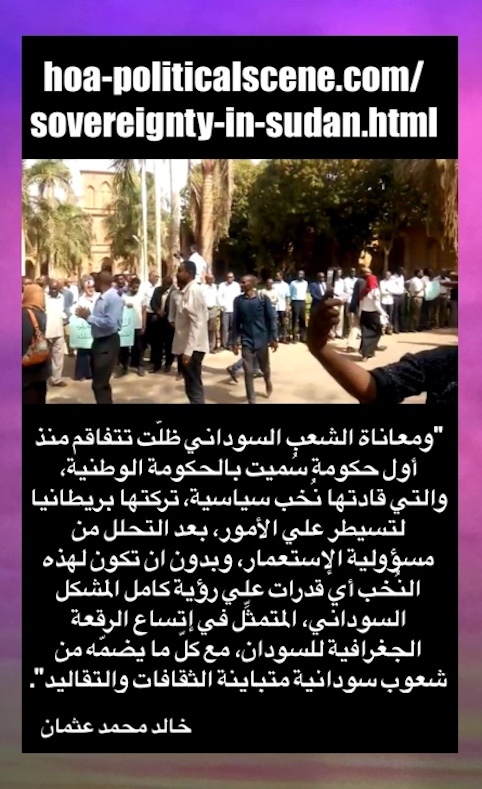 While the Sudanese people are demonstrating peacefully, demanding their legitimate rights, the regime's security agents harass them, beat them, bomb them and kill them. The security agents also take many Sudanese citizens to secluded detention centers in which they torture them to death. 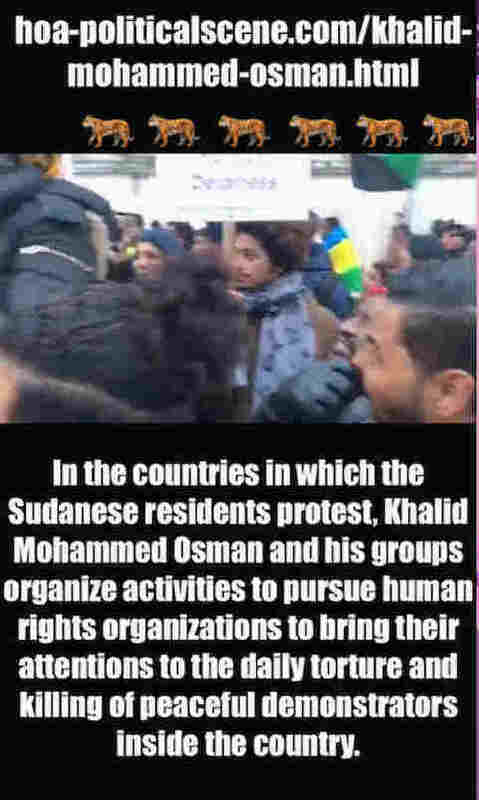 In the countries in which the Sudanese residents protest, Khalid Mohammed Osman and his groups organize activities to pursue human rights organizations to bring their attentions to the daily torture and killing of peaceful demonstrators inside the country. 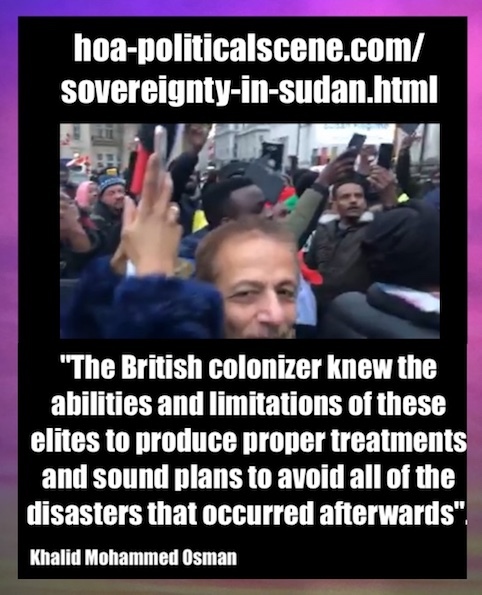 As you see the activities on this page are not intended to highlight the author Khalid Mohammed Osman personally, but rather to highlight everything that happens in Sudan until this moment. So, there's nothing personally intended, but, only a brief introduction to the author. 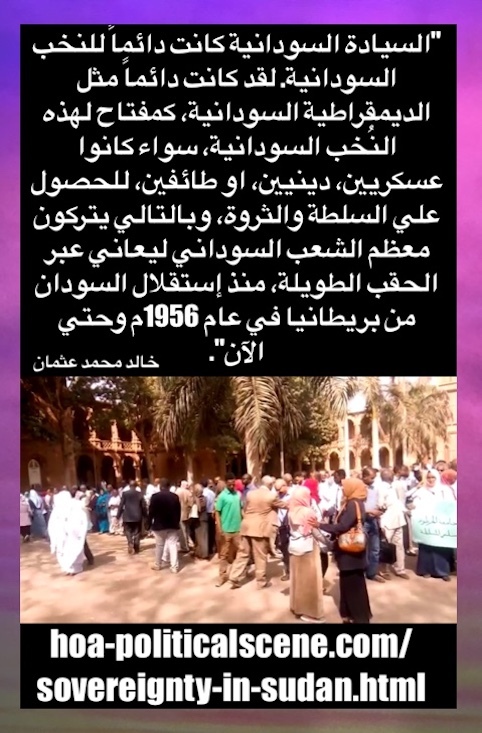 The human and political activities are running inside Sudan and abroad, continuously, since 1989, when the Muslim Brothers in Sudan conducted a military coup to bring the totalitarian regime, we see nowadays in Sudan. 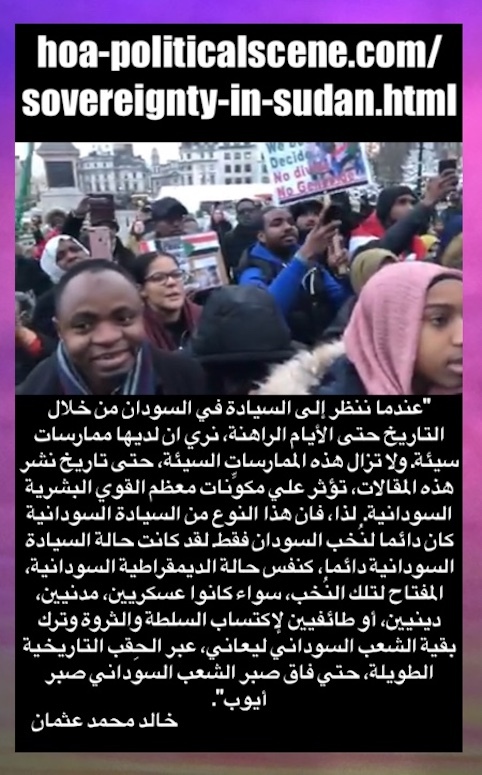 To know this activist, browse either the Arabic pages, or the English pages in the HOA Political Scene Network, including the Horn Africa's Network, where you will find most of the activities of the Sudanese journalist Khalid Muhammed Osman, along with other activists in this network. Khalid Mohammed Osman is a Sudanese Author and journalist. He began his careers almost half a century ago. He was pursued by many Sudanese dictatorial regimes to hunt him, because of his journalistic and public activities, so he fled his homeland many years ago. He writes political analyses, poetry, short stories and novels. He has some books in these genres pf literature and political writing. See the iTunes icons, at the right column. In some devices, this column moves to the bottom of your screen. Just to note that. He is also a human rights and political activist. Khalid Muhammed Osman engagement in the Sudanese revolution is clear, as well as the environmental and human activities, he ran somewhere, especially in Eritrea. See Awassa, Awassa Children's Village, Environment and Environment Protection. Khalid Mohammed Osman - خالد محمد عثمان! تشتمل هذه الصفحة الاسفيرية عن "خالد محمد عثمان" علي فعاليات حقوق إنسان وفعاليات سياسية عامة مشتركة للقضاء علي النظام العسكري الديني (Military Religious Regime) لعمر البشير (Omar al Basher)، المجرم الدولي في السودان والمطلوب لمحكمة العدل الدولية (ICC). 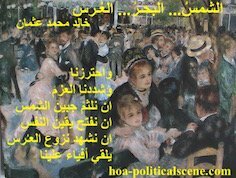 بمعني آخر ان القضاء علي هذا النظام الشمولي، الذي يقوده مجرمون إرتكبوا المجازر في حق الشعب السوداني، هو هدف كلّ الإنتفاضات، التي هبّت في السودان منذ ان أتي ما يُسمي بتنظيم الجبهة الإسلامية القومية (NIF)، بهذا النظام الدموي في عام 1989م، من خلال إنقلاب عسكري. وكان خالد محمد عثمان وظلّ يشارك تلك الإنتفاضات، في التخطيط، التحفيز، الدعوات المستمرة لإنجاح الإنتفاضات، كتابة المذكرات الجنائية الدولية وترجمتها، وتقديمها الي منظمات حقوق الإنسان، وإرسالها الي المجموعات السودانية الثورية، التي يشارك فيها، للإستفادة منها وتقديمها الي منظمات حقوق الإنسان، في الدول التي يحتجون فيها، علي الممارسات القمعية، التي يقوم بها النظام السوداني الفاشستي، والذي يّعدُّ من اسوأ الأنظمة الديكتاتورية السودانية (Sudanese Dictatorial Regimes) ضد السودانيين، الذين يتظاهرون سلمياً، مطالبين بحقوقهم الشرعية. لا تهدف الفعاليات الموجودة في هذه الصفحة إلى تسليط الضوء علي المؤلف شخصياً، بل إلى تسليط الضوء علي كلِّ ما يحدث في السودان حتى هذه اللحظة. لذلك، فلا يوجد غرض شخصي مقصود، ولكن، فقط مقدمة أدبية موجزة عن المؤلف الأديب والناشط الحقوقي والسياسي، والصحفي، وهي في مجملها نشاطات لم تبدأ في هذه الفترة من حكم الديكتاتور السوداني عمر البشير، بل بدأت منذ أيام الديكتاتور السابق جعفر محمد النميري (Jafar Al Numeri)، والديكتاتور الأسبق ابراهيم عبود (Ibrahim Abbud). اوكي، كان طفلاً في ذلك الزمن. الانشطة البشرية الإنسانية والسياسية المشار اليها تجري داخل السودان وخارجه، باستمرار، منذ 1989م، عندما قام الأخوان المسلمون في السودان بإنقلاب عسكري، لجلب النظام الشمولي، ونحن نري في الوقت الحاضر في السودان، ان هذه الإنتفاضات المستمرة لم تسهم في إنجاز أهدافها. ولذلك فان للناشط السياسي والحقوقي خالد محمد عثمان نقاط محددة بتفاصيل في خطط حيوية أخري، وأكثر ثورية، للقضاء علي هذا النظام الشمولي ورموزه وآثاره، يلخصها عبر مجموعة "النُّمُور السودانية" (Annumor AlSudanyah)، وهي في الواقع ما تحتاجه الساحة السودانية الآن. لمعرفة هذا الناشط، تصفح اما الصفحات العربية، أو الصفحات الانجليزية في شبكه المشهد السياسي للقرن الافريقي (HOA Political Scene) - إختصارا (هوا - HOA) ، بما في ذلك شبكة القرن الافريقي (Horn of Africa's Network)، حيث تجد معظم أنشطة الصحفي السوداني خالد محمد عثمان، إلى جانب نشطاء آخرين في هذه الشبكة. خالد محمد عثمان مؤلف وصحفي سوداني (Sudanese journalist). بدأ حياته المهنية منذ نصف قرن تقريبا. كان مطلوبا من قبل العديد من الانظمة الديكتاتورية السودانية (Sudanese dictatorial regimes)، بسبب أنشطته الصحفية والوطنية العامة، لذلك هرب من وطنه منذ سنوات عديدة، كما ظلّ يهرب من أنظمة ديكتاتورية مماثلة في بعض الدول العربية، مثل العراق. يكتب التحليلات السياسية والشعر والقصص القصيرة والروايات. 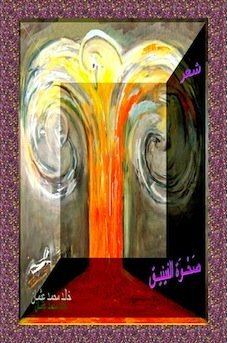 لديه بعض الكتب في هذه الأنواع الأدبية والسياسية. راجع أيقونات iTunes ، في العمود الأيمن. في بعض الاجهزة، ينتقل هذا العمود إلى أسفل الشاشة. فقط لملاحظة ذلك. والناشط هو أيضا من النشطاء الإنسانيين والسياسيين، ونشطاء البيئة. ان مشاركته في الثورة السودانية واضحة، فضلا عن الانشطة البيئية والانسانية، والتي كان يركض من أجلها في كلّ مكان، صاعداً وهابطاً من المرتفعات، في إرتريا (Eritrea)، خاصة في العاصمة الإرترية اسمرا (Asmara)، لتنشيط كل المدارس والاتحادات والجمعيات وطرح خططه البيئية لتنفيذها في المناسبات الإرترية الوطنية، وحتي في المناسبات الأسرية. انظر اواسا (Awassa)، قرية اطفال اواسا (Awassa Children‪'‬s Village)، البيئة (Environment) وحماية البيئة (Environment protection). 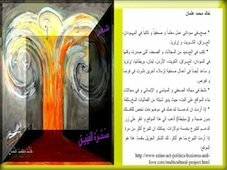 وبعد ذلك لا تقل لي، ان هذا الناشط (غير عادي). انه عادي جداً، خاصة وانه يعتقد ان هذا هو وجوده، وهذه هي حياته. ومن كان له هذا الوجود، ومن كانت له هذه الحياة، فبماذا يمكن ان نصفه؟ قليل من الوفاء، يا هؤلاء، قليل من الوفاء. 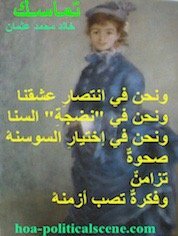 فالوفاء يُعبِّر عن اصالة وامانة، وإخلاص. To know more about Sudan, see Kordofan at 100-beautiful-sites-in-the-world.com. To watch documentaries on Sudan, see documentary film at TVCinemaApp.com. Did you like Khalid Mohammed Othman's activities? Did you like the national activities of the Sudanese people? Use the following comments form to comment on the activities of Khalid Mohammed Osman and add your comments on comments on Sudan. Comments on Khalid Mohammed Osman's activities appear on the Comment C2 Entries section on this network. Some of the comments appear on this section of the page below the comment form and above this paragraph. If you haven't commented, yet on the national activities of Khalid Mohammed Uthman and the national activities of the Sudanese people, please do that now. Thanks.